I have quite surprised myself to be reviewing another wine from France directly after my last review. 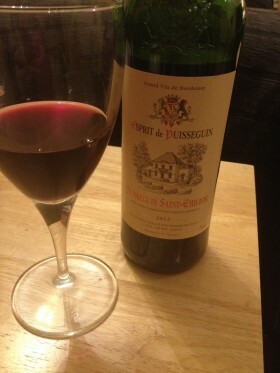 Trust me it was not planned, but this wine is from the great Saint- Emilion area and Puisseguin is a small type of commune making really good wine. The wine is everything you would expect of this area, a fine crafted wine from the merlot grape, full bodied smooth rich with deep fruit flavours leaving you intensely satisfied. The main reason I chose to review this stunning Bordeaux was the good value it offers, I paid £8.29 for it at Waitrose and I could put it against any at the £15-£16 price range. I will be buying more of this wine when I see it at the bargain price again, normally retails at £14. It is a wine to serve at a dinner party and not be worried about, my only worry is how to stop my husband drinking it all. Previous postPositive Result Next postA lot is happening !